Today, on the Your Home Story Podcast, we are diving into Suzannah’s Master Bedroom Design Reveal and sharing how she transformed her space in just under six weeks! We love chatting design and DIY. But even more than that, we love to share the whole process behind a room reveal. I shared about my Vintage Mid-Century Bedroom a few months ago and really loved taking you through the evolution of my space. Today, on the Your Home Story Podcast, it’s Suzannah chatting about her master bedroom and sharing more about why/how she tackled the space. It is a great feeling to put time and energy into a room and then call it FINISHED! 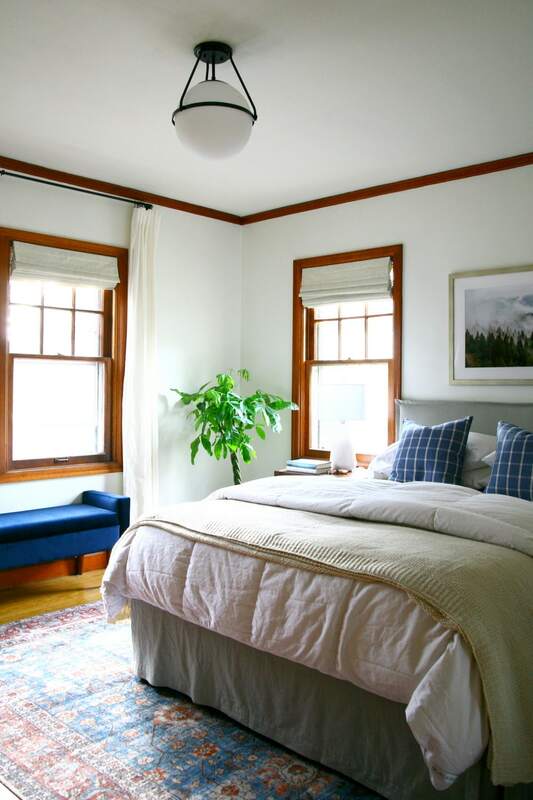 Suzannah did that over a 6-week period (including building an upholstered bed from scratch) for her modern traditional style master bedroom makeover, which she made over for the fall 2018 One Room Challenge. She shares what she learned doing a room (on a budget) in such a short period of time, plus tips for decorating around queen and king beds and other bedroom design challenges! All of Suzannah’s posts about her One Room Challenge (budget and bed DIY posts will be here when up!). Suzannah’s I Love Bedrooms pinboard. The upholstered bed tutorial she modified for her DIY slipcovered bed.